Initial AP Shell Velocity806 m./s. 140 mm/50 3rd Year Type8 х 1 pcs. Kii — Japanese promo premium Tier VIII battleship. This high-speed battleship was designed under the 1920 shipbuilding program. The ship was a further development of the Amagi-class battleship design. Compared with her predecessor, she had heavier armor protection. The Kii-class battleships were canceled as a result of the Washington Naval Treaty in 1922. Kii was first released for sale worldwide on 22 September 2017. Historically, Tier VIII premium Japanese battleship Kii was designed as a follow-on to the Amagi-class battlecruisers with thicker belt armor with slightly lower speed. She mounts the same main battery armament as her tech tree cousin — though they are a touch less accurate, reload one second slower, and have shorter range — in the same turret layout, and has comparable handling characteristics and surface/aerial detection values. Kii has some fairly noteworthy differences from Amagi, though. She is more vulnerable when broadside thanks to her thinner turtleback armor section and worse torpedo protection system (TPS), which provides roughly half the protection of Amagi’s TPS; subsequently, Kii is significantly more vulnerable to ship-launched torpedoes. She's far less vulnerable than Amagi to aerial torpedoes, however. Kii features a significantly improved AA suite, comprised of 100mm dual-purpose mounts for her long-range bubble — instead of the slower-firing 127mm batteries generally found on Japanese capital ships of the era — and large numbers of the Japanese variant of the 40mm Bofors that make US and Royal Navy mid-range AA so punishing. Her inner AA ring is flooded with copious quantities of standard Japanese triple-mount 25mm guns. All of this combines to give Kii an anti-aircraft suite nearly equivalent to American Tier VIII battleship North Carolina, much to the dismay of enemy carrier captains looking for an easy target. Further differentiating Kii from Amagi are her two triple-tube torpedo launchers, one each mounted port and starboard near her stern. Kii’s fish are similar to those found on Tirpitz, with a 6.0 km range and 14,400 alpha damage. The firing arcs of each launcher are generous and reminiscent of Admiral Graf Spee, enabling torpedo salvos from 40 degrees off the bow all the way back to nearly the stern of the ship. Unfortunately, when compared to her tech tree cousin, Kii gives up a lot for access to torpedoes and an AA suite similar to American battleships. While she has Amagi’s broadside, her accuracy is worse. She and Amagi have similar dispersion values, but Kii has the lowest sigma value at Tier VIII, clocking in at 1.7 (compared to 1.8 for Amagi, Monarch, Richelieu, Tirpitz, and Bismarck). Another downside of Kii compared to Amagi is that Kii’s citadel deck armor is only 22mm thick. This means that virtually all battleships in her matchmaking spread and even large cruisers such as Stalingrad and Alaska are capable of overmatching it (apart from lower caliber guns like the ones on Scharnhorst). As a result, Kii captains must be very careful with her positioning; she can take extreme amounts of damage if her turtleback is penetrated at virtually any range and any angle. While at first glance Kii may appear to be merely an Amagi with torpedoes, she has some key differences which encourage a very different style of play. Captains comfortable conning Amagi will enjoy Kii once they learn to adapt to those differences. 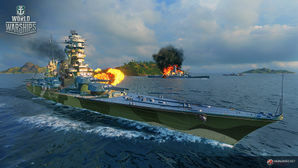 LittleWhiteMouse's Premium Ship Review: Kii from the NA forums. Incredible broadside firepower, with ten 410mm guns on 5 turrets that can do up to 12,600 damage per shell. Unlike Amagi, Kii can launch 3 torpedoes per side for close range engagements. Best long-range anti-aircraft suite of all Tier VIII battleships. Has both the strong AP and HE shells that Amagi has. Highest surface detectability range of all Tier VIII battleships. Lacks the powerful secondary armament and torpedo defense system of sister ship Amagi. Shorter main battery range than most of her Tier VIII counterparts. Sigma value of 1.7 is worse than Amagi. Thin citadel plating means that she will be citadelled with ease from many battleships she will face. Less torpedo protection than Amagi. As a premium ship, Kii doesn't have any upgrades to research. Upgrade Slot 1 provides two viable options. The first is Main Armaments Modification 1 ( ), which increases the survivability and reduces repair time of the main armament. Players wishing to specialize in anti-aircraft (AA) duties should take the second option, Auxiliary Armaments Modification 1 ( ). This upgrade increases the survivability of AA and secondary battery mounts. Upgrade Slot 3 provides options for specialization in certain roles. Aiming Systems Modification 1 ( ) is typically recommended for ship to ship combat. However, Kii possesses a formidable AA armament. Players wishing to specialize in AA should mount AA Guns Modification 1 ( ). This upgrade is most effective when the ship's commander is specialized with commander skills, including Basic Firing Training, Advanced Firing Training, and Manual Fire Control for AA Armament. Upgrade Slot 5 provides two options. Concealment System Modification 1 ( ) reduces ship detectability and increases dispersion of enemy shells fired at the player's ship. This upgrade is useful because it provides Kii with more ability to disengage to repair sustained damage, especially when paired with the Concealment Expert commander skill. The second option is Target Acquisition System Modification 1 ( ). Players who enjoy brawling may find this upgrade useful, because it improves the acquisition range of ships and torpedoes. It also improves spotting range by 20%. Given that Kii has a distinctly un-Japanese AA battery for a battleship, it might well be worth investing in captain skills designed to take advantage of this. Otherwise, captains are encourage to pursue a cookie-cutter survivability based battleship, choosing skills to help Kii stay afloat longer. Both options are viable, and the decision between the two is mostly down to personal preference. As a premium ship, Kii comes included with Type 10 camouflage that lowers her detection radius, reduces the accuracy of incoming shells, reduces her repair costs, and increases the amount of experience she earns. As a Tier VIII premium battleship, Kii can mount eight signal flags simultaneously. India Yankee ( ) and India Delta ( ) flags are recommended to improve the ship’s survivability. November Foxtrot ( ) is also recommended to decrease the cool down on the Repair Party ( ) and Damage Control Party ( ) consumables. Captains looking to further improve the ship’s anti-aircraft battery should mount November Echo Setteseven ( ) flags. Lastly, economic and special signal flags can be mounted to further increase the ship’s experience and credit gain per battle. Kii delivers a full broadside. For those about to die, Bad Advice Captain salutes you! This friendly New Orleans must be avenged! This Fletcher needed backup; Kii brings her guns to bear. Good usage of Spotting Aircraft ( ) is key to long range shots. Timing this landing is Kii. Flag of Kii. Given to players who purchased a special bundle containing Kii. Upon the eve of the First World War, the Imperial Japanese government had approved the latest 1918 Naval Construction program; dubbed the “six-eight” fleet, calling for six new battleships and eight new battlecruisers. Despite the fact that this was already taxing the national budget by a third, the Navy proposed to extend the plan to “eight-eight” in order to maintain closer parity with the United States, whom declared in 1919 they would resume their 1916 Naval construction plan of 10 battleships and 6 battlecruisers. The task fell to Captain Yuzuru Hiraga, to design what would be the 4 ships of the Kii-class. To speed up the design process, the work on the Amagi-class battlecruisers was re-purposed into this design. Conceptually, Kii-class battleships were Amagi-class battlecruisers that traded speed for more protection. This philosophy was borne out of the lessons that Japan learned from observing the Battle of Jutland. Although speed has always been a decisive factor in combat, the eponymous battle made it clear that sacrificing protection is not an intelligent decision. As such, the Kii-class was a step in amalgamating speed and armor; the conception of the fast battleship. Therefore, the most significant aspect of Kii’s design was the choice to mount a main belt with a thickness of 293mm belt. Furthermore, it was angled out 15˚ from vertical. Not only did this allow an increase in effective thickness for lateral hits, but it also created an “immunity zone” between 12,000-20,000 meters against 16” shells. The Japanese understood 16” were quickly becoming the standard, and thought best to mitigate damage from hits received at standard engagement distances. Regardless of the increase in protection, the designers sought not to make the new class of ships sluggish, and as such ensured that the Kii-class could attain speeds close to 30 knots. To do so, they would install no less than 19 oil-fired boilers that fed to 4-geared turbines. In total, this generated over 130,000 shaft horsepower. The armament for the Kii-class was never fully standardized in the designs, but the most common proposal was to mount ten 410 mm/45 Type 3 guns in 5 turrets: two forward, two aft, and one amidships. Such an arrangement allowed for a broadside weight of about 10,000 kg flying at sub-800m/s. Standardized on the Nagato-class battleships, the Japanese found no error in carrying the same armament over for their latest projects. On the other hand, in a nod to the era of dreadnoughts, the Kii-class still carried its sixteen 140mm/30 Type 3 secondary armaments in casemates, which had limited traverse and manual operation. A unique addition to round out the offensive complement of the new battleships, designers opted to install eight torpedo-tube launchers on traverseable above-water mounts. By 1921, all four ships were ordered to be constructed in pairs. The projected completion date would be late 1923, but the year 1922 would change all that. All major naval powers convened in Washington and in a few days ratified the eponymous naval treaty that would curb this foreseeable resurgence in naval competition. It stated all battleships above the displacement of 35,000 tonnes would be scrapped forthwith, and as the Kii-class was above 42,000 tonnes, the treaty spelled their termination. Progress on 'Kii and her sisters was halted prior to their keels ever being laid down, and they were officially cancelled in 1924. Light and dark green camouflage was only applied to aircraft carriers in 1944. Even though Kii is fictionally modernized, Japanese battleships during World War II were painted in overall dark gray. Actual planned anti-aircraft complement was four single 120 mm guns. Kii’s anti-aircraft configuration is fictitious; Kii is sporting World War II era AA guns even though she was a 1920s design that was ultimately cancelled and never constructed. Japan only acquired 40mm Bofors guns from captured stocks in December 1941, during the Malayan Campaign. The Japanese version of the 40mm Bofors had a defective fuse design which limited its effective range to ~3.0 km. The triple mount version of the 25mm gun did not enter service until 1941. Yuzuru Hiraga, famed Japanese naval architect and lead designer of Kii. This page was last modified on 19 February 2019, at 10:09. This page has been accessed 90,006 times.